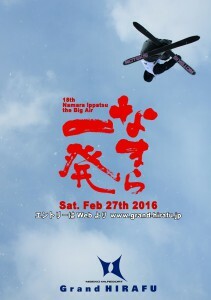 Niseko Grand HIRAFU’s time-honored Big Air contest has been held 17 times until now. 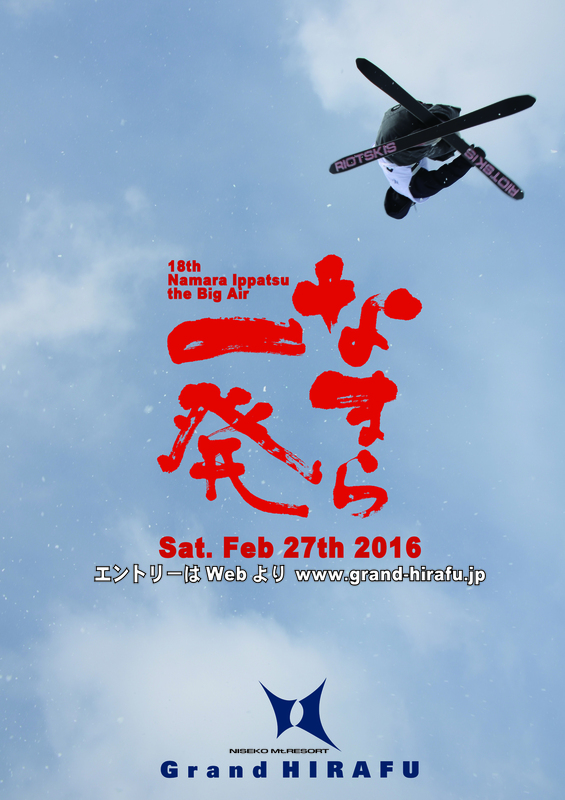 The 18th Namara Ippatsu the BIG AIR on Feb. 27th 2016. We’re looking forward to see your SUPER STYLISH JUMPS, everyone!! ■Sponsor: Tokyu Resort Service Co. Ltd.
・Open Class (15m stepdown kicker) Max 80 entrants, aged 10 or above. ・Women’s Class (15m stepdown kicker) Max 30 entrants, aged 10 or above. ※We have expanded the age range eligible for participation in the Open Class and Women’s Class, due to the recent higher levels among participants. Participants from aged 10 and older will be eligible to compete in the Open Class and Women’s Class, but please be aware that the jump kicker will be adult-sized. Jumping involves risk of injury. Please choose your category in accordance with your own level and experience. Participation Requirements: Must have sports accident insurance or equivalent insurance. Wearing helmets during the competition is compulsory (no helmet rentals). *We also recommended wearing protectors and other similar gear. Aged under 20 must obtain the consent of their legal guardian to take part. Fill in the required fields on the participant application form, and apply at the information desk in Mountain Center. We request that you read and confirm the details in followning documents beforehand. Read and understand following documents and access Entry Form page shown in below.